Trees to Plant if You're Allergic to Basically Everything | Mr. Tree, Inc. Trees are beautiful additions to any home or property. They add vibrancy to any area, provide shade for us and for our plants from the strong summertime sun, and give all of us the oxygen that we need to survive. Everyone should be able to plant and grow their own trees if they desire to. But unfortunately, that can be easier said than done, especially if you suffer from allergies. How could you possibly plant and grow a tree if it’ll cause non-stop sneezing and coughing? Well, we here at Mr. Tree are here to help with that. We don’t want your allergies to hold you back as you deserve the beautiful yard that you have always dreamed of having, so here are some tips for planting a tree, even with your allergies. To provide you with a broad idea of trees to start looking into, before delving into a bit more detail, ironbark trees are a safe place to start. These trees are a type of evergreen tree that usually have a dark red or black color bark. They tend to thrive best in dry climates and therefore should not be planted in wet or clay soil. Ironbark trees vary, especially in size. Looking for a short shrub? There’s an ironbark tree for you! Prefer a large, towering tree? There’s an ironbark tree for you, too! Now, let’s look at some deeper, more specific tips for planting a tree even when you do suffer from allergies. It appears that eucalyptus is becoming more and more common, especially as we now see it as a popular scent of candles, lotions, and used as a form of stress-relief. In addition to all of this, allergic reactions to pollen from eucalyptus trees are a rare occurrence in the United States. Plus, from about the middle of fall until the late spring, you will likely find a small pink flower bloom on your eucalyptus tree as well for added beauty. Despite there being over 900 different species of eucalyptus trees, there are some that are more popular in the United States. If you’re looking for a tree that can grow from about 50-60 feet tall, Eucalyptus cladocalyx (the sugar gum tree) and Eucalyptus mannifera (better known as brittle gum or the red-spotted gum tree) should be on your list. If you’re looking at a tree that is about 35 feet tall, a Eucalyptus platypus (round-leaved moort) may be the one for you. This species tend to have lime-colored flowers and oval leaves. If you are looking for a tree that is shorter than 10 feet, look into Mallee Eucalyptus trees. Please keep in mind that these do tend to look more like shrubs than trees though. Crepe myrtle trees tend to not pose an allergy problem. They also attract the eye of all those who pass by with its bright-colored floral blooms and pretty bark. These trees are not only full of vibrant colors in the spring and summer, but also tend to have great color in the fall as well. Yes, that’s right – not only is this tree a low-allergy tree, but it stays beautiful almost for the entire year, winter aside. 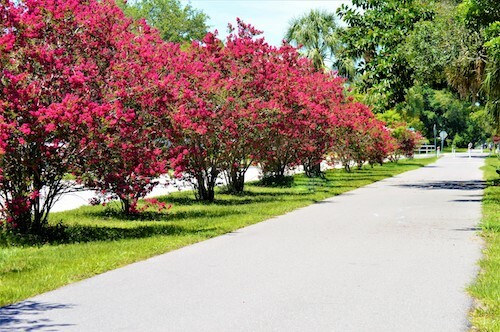 There are several types of crepe myrtle trees for you to consider: the Japanese Crepe Myrtle, the Indica Crepe Myrtle, and the Queen’s Crepe Myrtle. Like any tree, these trees do need to be pruned and this should happen either during the wintertime, or in early spring. A little tip: don’t be afraid to cut off some of the dying flowers during the crepe myrtle growing season. Doing this will allow a second, lighter bloom of beautiful flowers to occur. Magnolia trees offer a beautiful fragrance, but it’s one that likely will not trigger your allergies. In addition to its smell, these trees are also known for their beautiful blossoms, which come in yellow, red, pink, purple, or white. To make these trees even more unique, they are diverse both in plant form and the shape of their leaves. However, most magnolia trees do have large blossoms that you can’t help but be in awe of. There are evergreen magnolias which can grow 40 feet in width, so be sure that you have the yard space before planting one of these. Meanwhile, saucer magnolia trees and star magnolia trees grow as tall as 15-20 feet. These are the main magnolia trees that you may be familiar with, but there are other magnolias that are less widely planted if you are interested, such as the large-leafed magnolias, known as the cucumber tree and the yellow cucumber tree. Other medium-sized trees (but still with large leaves and flowers) are bigleaf magnolia, umbrella magnolia, fraser magnolia, and ashe magnolia. You have likely seen at least one red maple tree in your lifetime – have you ever thought to grow your own in your yard? Well, now you can, even with allergies! What makes these great trees even more special is the fact that regardless of the season, there is some form of red on this tree – whether it be as a bud, as a leaf, or as a flower. This tree is also becoming more and more popular in North America as it adapts well to various environments. These trees grow into mid-sized to large, and can pop up quite fast. In the span of a year, a red maple tree may add anywhere from 2-3 feet of growth. At maturity, a red maple tree will be 40-60 feet in height, and a width of 25-45 feet, so make sure you have room for this beauty first. Allergies can be daunting and make everyday tasks, such as driving with the windows down in the spring and summer months, or growing your own garden or yard, impossible. But we want to make sure that allergies do not hold you back from planting and growing that beautiful, vivacious tree that you may have dreamed of as a child. This was just a glimpse at some tips for planting a tree when you suffer from allergies. But fear not, there are even more options that will not set you off into a coughing or sneezing fit.